Chateau LeVeaux Suite #302 is the ideal place to rest after a day of skiing, hiking, biking, and exploring Lake Superior's North Shore. Enjoy everything Chateau LeVeaux has to offer with Suite #302- including indoor swimming pool, hot tub, sauna, and game room. Great for the whole family. Chateau LeVeaux Suite 302 is a 3rd floor, suite at the Chateau LeVeaux resort. This suite features two queen beds. Enjoy stunning, unobstructed Lake Superior views from the large, room wide windows. Thanks to the large windows this suite is bright and cheerful. The sitting area is a great place to eat a meal, read a book, or just sit back and enjoy the views. This room features a TV with satellite and a DVD player, a mini fridge, a small microwave, and coffee maker. The bathroom is divided into two rooms, with the vanity in the front and the toilet and shower/tub combo in the back half. Chateau LeVeaux is a 34-unit vacation rental resort located on Lake Superior`s North Shore. The large lobby is a great meeting area for large groups renting multiple units. Enjoy your breakfast in the community lobby area. Complimentary coffee is available for you to enjoy in the mornings. The community deck has plenty of room for large groups to gather. Or just you and your loved one sipping coffee and enjoy the Lake Superior views. Enjoy an outdoor meal on the community deck. Take a dip in the heater indoor pool. The pool area also has a hot tub, sauna, and a game room, great for kids On the grounds of the resort there are lots of places to grab a seat and enjoy the view. Or head down the stairs to the private lake front area. The lake front area in from of Chateau LeVeaux is ledge rock, great for sitting and watching the waves roll in. The gorgeous views looking up the shoreline. And don`t forget the views looking down the shoreline The community fire pits are also a great place to gather and enjoy time with friends, family, and other Chateau guests. Map of Chateau LeVeaux property. 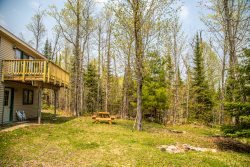 Maple Haven on Caribou Lake is tucked in a beautiful sanctuary of maple trees and wild flowers. Located on the third floor of Chateau LeVeaux Resort, you can see far out onto the lake through this Suite’s expansive set of windows. Watch the seagulls, waves and moon rise from this beautiful and updated room. You will also be able to enjoy the special amenities that Chateaux LeVeaux Resort offers, including a large deck with lake view, perfect for watching the sunrise or sunbathing, Lake Superior Ledge Rock Shoreline, Pool, Hot Tub, sauna, and game room. The resort is located on a quiet stretch of Highway 61, just a few short miles from many local North Shore attractions. Here you are just a short drive away from the beautiful Oberg Mountain Scenic Overlook and hiking trail, a must-see during leaf changing season. Head down the shore and check out Temperance River State Park or head up the shore and you will find Cascade River State Park, both great for hiking and enjoying some beautiful waterfalls. The Gitchi Gami Bike Trail goes right in front of the resort and runs along Highway 61. The trail is enjoyed by bikers and walkers alike, taking a scenic ride or stroll along Lake Superior's shoreline. The Lutsen Mountains recreation area is just 10 miles away and offers both winter and summer activities including skiing, the alpine slide, and a scenic gondola up to the Moose Mountain Summit. Enjoy the many restaurants and live music offered year-round on the mountain, as well. but can be purchased locally. Great location. Managers very accommodating. Shade needs repair as needed to remove by day and reinstall at nite. Front desk clerk was great!! The couple at the desk were very nice and extremely helpful. The room was clean. The view was amazing. Beds were comfortable. It was my first time staying at a place that was owned by people. It was alittle difficult to get used to not having housekeeping services, but it was fine. The people working the desk are always wonderful and friendly and it is a joy to see them year after year. The facility is wonderful and has a nice homey feel, we have been visiting Chateau for over 7 years and love the pool facilities and deck area. We stayed in one of the rooms on the third floor and the view was the best! Very comfortable beds. Loved the large coffee maker not one of those small ones. The couple that runs the place were so friendly and helpful. The location is prime. The setup is nice. No negatives at all. Fire pits. Nice deck overlooking Lake Superior. Love it! suite 302 was just want we were looking for, reasonably priced with a perfect view and amenities (fridge & microwave). The only question is the deck floor and how noisy it would be during the busy season. The husband and wife that run Chateau Leveaux were both very friendly and accommodating. They were very helpful and friendly while at the same time giving us space and privacy to have a secluded weekend retreat. They are doing a nice job. We really enjoyed the room's view and the cozy and welcoming atmosphere. All of the common areas were organized and welcoming, too. The stairways on the grounds leading down to different beach areas were a lot of fun. Hosts were welcoming, warm and informatve. Things were so perfect we never had to call upon them, it was already done. This is the perfect getaway for a family or friends. The view says it all. The beds welcome tired, sore bodies and revive them for the next day's activities. The pool, spa and sauna don't hurt either! Everything is clean and neat. It just could not have met our needs any better;however, a slightly larger fridge would have been nice - more wine, cheese and smoked salmon! Very friendly people; like your next door neighbor! Quiet, peaceful atmosphere. The waves from the lake provide the perfect element for a relaxing sleep. The onsite managers were friendly and very helpful when we had an issue with the tv. The room was pleasant, clean and comfortable. Tofte is centrally located so it is easy to visit the many state parks in the area. The deck is wonderful. i loved it and did not want to leave. it was nice and quiet and relaxing. This is a special getaway treat! I've travelled all but 12 of the 50 states and I can't think of anywhere else that compares with this location both in the spring and the fall. The room was perfect, the front desk personnel were extremely helpful and pleasant. Definitely will stay there again and we highly recommend it. We had so much fun in the whirlpool and swimming pool after snowboarding. Very relaxing. The large inviting lobby allowed us all to gather to play games and visit with a beautiful view of Lake Superior. Loved it! We will come back. Hotel Room 302 has a beautiful view, good bathroom facilities, excellent spa and pool, glorious deck with furniture. This is our 4th stay; sadly the hair dryer was removed and there was no coffee to be made in the room. Otherwise, all was superb! One thing we truly value about the Chateau is that all of the rooms face the lake! We love that it's a smaller facility so it isn't over crowded. The staff was friendly and eager to assist or recommend a place to eat. They seemed genuinely interested in the people staying with them. One minor suggestion would be to put a light on or near the sign. I realize there is a sign saying to take the "second right"... But a light would be nice too. We loved our stay and can't imagine staying anywhere else when we go up north!! View was amazing. Bed was comfortable. Room was nice. But bathroom really needs an upgrade. The view of Lake Superior from the room and the ability to listen to the Lake waves all night long are the reason we continue to return to this room. The manager is awesome and went above and beyond! Pool area was the best and really appreciated an actual "hot" hot tub. Would love to return and stay longer with more family members.